I started to make bread out of frustration. I couldn't find a fresh bread that was made out of flour, yeast, water and salt. Optional is a little sugar and oil. I was lost in the ingredients list of store bought bread. I went on-line to find out what type of the ingredients are added in the bread making process. Azodicarbonamide - dough conditioner. Small detail - it is "banned from use in Europe because studies showed it could cause asthma or allergic reactions". Monocalcium phosphate - "a leavening agent and preservative". Calcium propionate - "a preservative that inhibits mold and bacterial growth. Considered safe, but in the early 1990′s it was linked to attention deficit disorder in children". High-fructose corn syrup - no comments on that. Mono and di-glycerides, ethoxylated mono and di-glycerides - who knows where this come from! "Did you know that L-cysteine, a common dough conditioner, flavor enhancer in human and pet foods, and precursor in some dietary supplements, is most often derived from human hair or duck feathers, and to a lesser extent from pigs' bristles and hooves?" I had enough. I rolled my sleeves, and went from the research mode into the baking mode. And my bread making journey began. 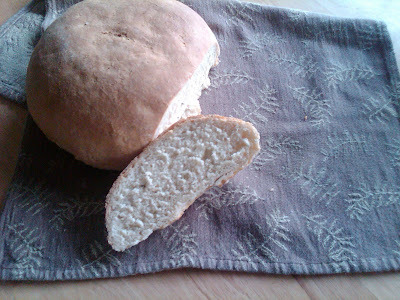 Next post - easy bread recipe, just like grandma use to make.